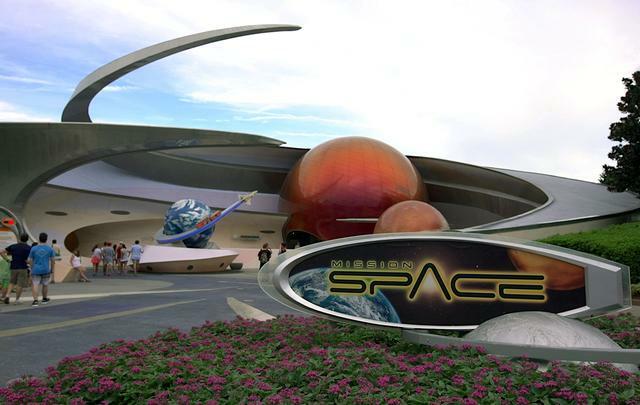 Mission: Space is a motion base ride in Future World - Mission: Space at Epcot. While it's not the best, it is also recommended. The minimum height to ride is 44 inches. Do note that this is a centrifuge-type attraction, based on the spinning machines used to train astronauts to handle high G-forces and weightlessness. On this ride, you will experience 2.5 Gs of force over a sustained period, followed by simulated weightlessness. If you have high blood pressure, are significantly overweight, or have any history of heart problems, you should not ride the spinning “orange team” version of the ride. Choose instead the “green team” option, where your ride vehicle does not spin and you’ll experience none of the extreme G-force or simulated weightlessness. The capsules are a tight fit either way, so anyone with claustrophobia should just skip the whole thing. I'm a sucker for Mission: Space, but the new "upgrades" did little to change the experience. Disney spent a lot of time touting the improvements to the attraction, but aside from re-filming the pre-shows (giving Gina Torres the exact same script Gary Sinise had almost 15 years ago), there's very little new here. Perhaps I was expecting some new, improved imaging on the ride or a slightly different story, but in the end, it's pretty much the same experience it's been since Disney tuned down the ride after its first year of turning guests' stomachs. I still love the ride, but I'm disappointed Disney didn't do anything to actually upgrade the experience.